A slow-draining sink is one of the most common plumbing problems. Typically the problem is simply a matter of hair, soap, grease and other such debris clogging the drain. While you may be able to use your sink for some time, it will eventually become a much bigger problem. With all of this in mind, here is how to go about fixing a slow draining sink—there are several different plumbing solutions you can try (note: always avoid drain cleaners). To ensure that you don’t have a more major plumbing problem in your home, check the other sinks to ensure that the problem is isolated to one sink. If not, it could be a sign that your septic tank is backing up. Call a professional plumber immediately. One of the most classic plumbing solutions when it comes to a slow-draining sink is to pour ¼ cup of baking soda down the drain and follow this with 1 cup of vinegar. Plug the drain with the sink stopper if you have one and wait 15 minutes. Then, pour the boiling hot water down the drain. Repeat as necessary. Another method you can use to fix a slow-draining sink is the plunging method. If you’re working with a bathroom sink, it is imperative to remove the sink stopper first; otherwise you are simply just moving the stopper up and down. To remove the sink stopper, pull it all the way up, turn it to the left and then unscrew it. Next, fill the sink up with enough water to cover the drain. Ensuring that the plunger is tightly sealed around the drain, begin plunging. Next, take a flashlight and check for a blockage, removing it as necessary. If you can’t see the blockage, repeat this step again. Sometimes, build-up may be located in the P-trap. Begin by placing a bucket under your P-trap and remove it (this may require the use of a screwdriver). Inspect your P-trap for a potential blockage and remove it. If you don’t see a visible blockage, the clog may be located in the pipe that goes to the wall. If that’s the case, using a plumbing snake will be required (never a coat hanger), but plumbers will advise against this if you are inexperienced because it can lead to additional problems. Your next best course of action is to call a plumber. 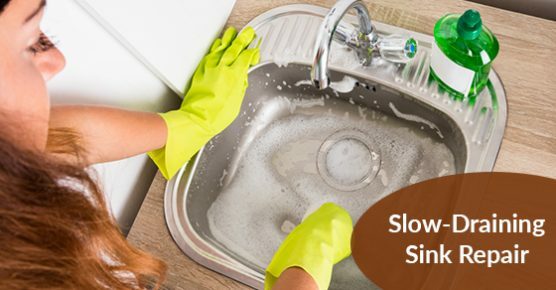 If you have a slow-draining sink, call Advanced Plumbing, the plumbing experts, at 877-286-8044, or contact us online here. Advanced Plumbing offers fast plumbing solutions, provides 99.9% customer satisfaction and honest pricing.